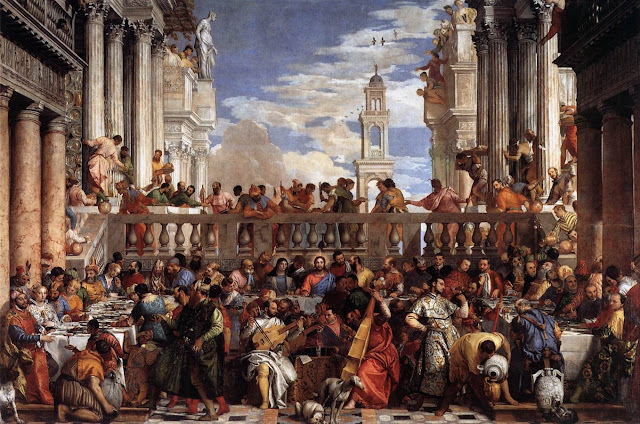 The work which came immediately to my mind when I read this sentence in A Venetian Theory of Heaven, was Paolo Veronese’s (1528 – 1588) Wedding of Cana which today hangs in the Denon Wing of the Louvre Museum (in the same room as the Mona Lisa) after it was looted by Napoleon from the refectory of the Benedictine monastery of San Giorgio Maggiore. The refectory was built to a design by Palladio and completed in 1562. The friars commissioned the painting from Veronese in 1562, insisting that the work be monumental and Veronese certainly delivered– the work originally measured 70m2 (it is the largest work in the collection of the Louvre museum). Veronese worked on the painting for 15 months, completing it in 1563. The Wedding of Cana marked the beginning of a fruitful collaboration between Palladio and Veronese – they later worked together on the Villa Barbaro at Maser. The work was feted around Europe – Cosimo III de’ Medici claimed that it was worth the trip to Venice just to see this painting. The Wedding of Cana hung in the refectory for 235 years until Napoleon ordered that the work be confiscated. It was torn from the wall, cut in half for the journey, rolled up like a carpet and shipped to Paris in 1797. As a result, the painting suffered from significant paint loss and it underwent restoration in the 18th and 19th centuries, but records from these works are incomplete. Napoleon, of course, literally ‘captured Venice’, when he forced the city to surrender in 1797. During the French Republican and Napoleonic eras, looting became a military tactic by victorious armies. Napoleon established the first official military division dedicated to seizing and shipping captured artworks. Specially-trained personnel would follow behind the army to inventory, pack, and ship art. Stealing art from vanquished countries was a morale booster, and looted masterpieces were moved to the recently converted Louvre museum, where Napoleon’s art advisor Dominique Vivant Denon became the museum’s first director (remember which wing of the Louvre museum houses this work?). 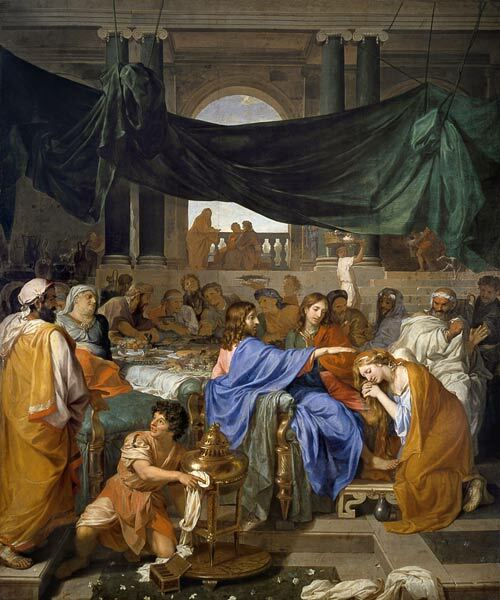 In 1815, when the allies who had beaten Napoleon negotiated the redistribution of confiscated works of art, the size of The Wedding of Cana presented a conundrum, and the negotiators settled on an unsatisfactory exchange of this masterpiece. The Wedding of Cana remained at the Louvre, and in its stead, Venice received The Pharisee’s Banquet with Mary Magdalene at Christ’s Feet by French artist Charles Le Brun (now at the Accademia in Venice). In 1992, whilst undergoing restoration, the Louvre was embarrassed by two separate incidents with The Wedding of Cana – it was first spattered by water from a leaking air vent and just a few days later, as museum workers were raising the 1.5 ton painting to a higher position on the wall, one of the supports collapsed and the entire painting fell. The accident tore five holes in the painting. The Benedictine monastery at San Giorgio Maggiore was destroyed under Napoleon. It was later used by the Austrian army. The island became a free port and was later home to the Venice artillery, and a new harbour was built in 1812. In 1949, Count Vittorio Cini established the Giorgio Cini Foundation in memory of his son, Giorgio Cini, who was killed in an airplane accident at Cannes. The original purpose of the Foundation was to restore the former monastery and to create a cultural centre for Venice. The Fondazione Giorgio Cini has advocated for years for the return of this masterpiece to Venice. According to reports, they have been told that whilst intellectually the painting belongs in the refectory of the monastery, politically, it can never be returned. On 11 September 2007 (the 210th anniversary of the looting of the painting by French troops) a full scale facsimile copy of the painting was unveiled in its original location at San Giorgio Maggiore. The copy was commissioned by the Fondazione Giorgio Cini. The Louvre museum website’s notation for the painting merely states that this work ‘entered the Louvre in 1798’.